"Practicing Dentistry With An Honest Approach And A Gentle Touch"
In the past, it was generally accepted that fluoride should be mainly used for children whose developing teeth fluoride helped the most. But through the years, more research has been done and fluoride is being shown to help prevent tooth decay in people of all ages. You don’t have to go to the dentist to get fluoride. Many toothpastes and some mouthwashes contain fluoride. If upon speaking with your dentist, it is determined that you have a more serious risk of tooth decay, you can be prescribed fluoride treatments that you can use in your home. Fluoride, while not the only necessary dental hygiene practice, can work in conjunction with brushing and flossing to help you maintain healthy teeth for a lifetime. Dental x-rays are needed when you are added as a new patient and ongoing every 6-18 months, depending on the your particular needs. 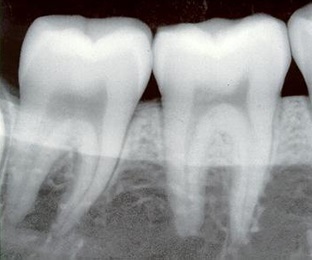 X-rays help us find hidden dental decay, impacted teeth, show bone loss, cysts, abscesses and more.